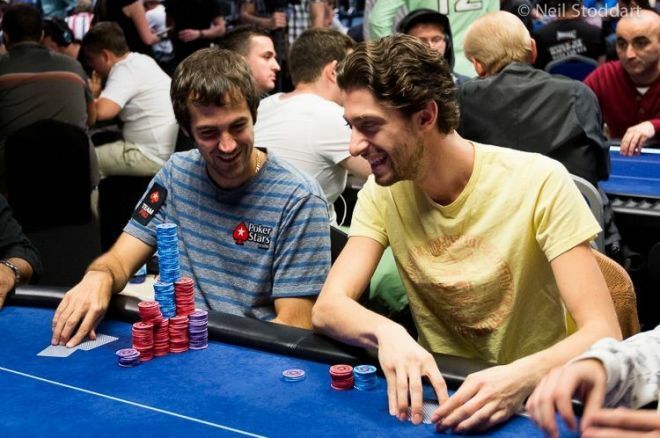 Early in a hand, when the pot is small, behavior that can be described as ostentatious (i.e., attention-grabbing, or conspicuous) will tend to be seen from players with weaker hands. This is due to the same reasons I’ve talked about for early-hand verbal behavior: players with very strong hands don’t like to draw attention to themselves early in a hand, when the pot is small. Rather, they will tend to be silent and not make ostentatious movements. Wording the tendency as I did above, in terms of ostentatious behavior, lets us see the verbal behavior tendencies as just one part of the overall tendency not to draw attention, no matter the type of behavior, verbal or physical. Also, in general, players who move around a lot, will tend to not be setting traps. Later in a hand, the physical tendencies become different, as they do for verbal behavior. This is why you will often see players betting strong hands (when the pot is big) do all kinds of unusual, ostentatious behavior. For example, a player with the nuts might slam his chips hard into the pot on the turn, saying something goading to an opponent. He is no longer in cagey, silent, inconspicuous mode — the pot is bigger, he has fewer decisions left, and he’s more relaxed and carefree. Let’s look at a few examples of early-hand, small-pot behavior and how it can provide practical information. Again, these clips come from Windy City Poker Championships footage, courtesy of Kirk Fallah at Fallah Productions. Here Moneymaker has raised and his lone opponent, Don Bates, calls with . Bates has a lot of body movements before and after making the call, especially afterwards. He also asks “Is it five?” before calling, referring to the raise amount. This is pretty subtle behavior, yes, but this amount of movement will still tend to make premium hands like or better unlikely for Bates. This is not terribly useful, considering preflop calls with those hands aren’t that common, but it is still some information. Also worth noting is the fact that immediate calls are very useful for limiting the range of a caller. In fact, immediate calls could be thought of as a kind of ostentatious behavior, especially when the accompanying physical motions are more dynamic and aggressive, as Bates’s movements were. Compare this example to the previous one — here we see a player, Lloyd Mandel, just calling a preflop raise with . Note that his body movements are pretty restrained. He does move around, but you probably wouldn’t categorize his motions as “ostentatious” or “attention-grabbing.” This is a good example of how most people will act with big hands, especially early in a hand and especially if they are only calling, and not raising, with those hands. Here Michael Sabbia raises with . He then gets joked with by Mohsin Charania who calls behind him, and Sabbia laughs pretty uproariously in response. Also interesting in this hand: Charania’s talking after calling Sabbia’s raise also will make it less likely that he is very strong. We see the UTG player limping in with . He throws his chips in rather forcefully and moves around a good amount afterwards. Keep an eye on him in the left foreground after the camera cuts. He double-checks his cards and continues moving around quite a bit. These excessive, rather ostentatious movements make it less likely he’s limped in with a big hand. These kinds of small clues can come in handy when you’re playing against players who are capable or prone to limping in early position with big hands, hoping for a raise. Gordon, who has , smiles and emits a small laugh before calling Ramdin’s continuation bet. Here in a multi-way pot, Gary Carr bets with on a board of . He bets with a good amount of forward force and he does some slamming of chips after betting. These ostentatious motions, although subtle, will make very strong hands like sets less likely. If he had a very strong hand, I would predict he’d be more thoughtful and gentle in his physical movements. As with all poker behavior, we should remember that these are not often going to be huge game-changers, although they will sometimes be. The behaviors we’ve talked about in these articles are mainly useful for making the strongest hands in a player’s range less likely. Even assuming the tell is reliable for a specific player, there may still be plenty of strong hands remaining in a player’s range. Your experience and confidence in using these reads against average players. How reliable you think these tells are for specific players. The “Poker Tells Guides” I recently made available on my site examine these kinds of subtle behaviors and more. The guides are focused on analyzing real poker footage, with emphasis on what the behavior will generally mean and what it might mean in the specific situation shown. If you’d like to learn more about the ideas in this article, I recommend these guides to see how these ideas show up at the tables. Zachary Elwood is the author of the books Reading Poker Tells and Verbal Poker Tells, available in paperback and e-book formats via via Elwood's website. He recently released a new poker tells video series, available at www.readingpokertells.video.